Last month, my son was grounded, and I took his electronics away. No I-Pod, no video games, no tv, no computer, nothing! We have always had limits on how long the kids could play on the computer, the tablet, and gaming devices. However, when he was completely barred from them, I noticed a big change in the house, so big that I decided that even though we had restrictions, we needed more. Without the electronics, the kids started using their imaginations more. The blocks were in use again. The train track was set up daily. Both kids would get lost in their own little world, and it was fascinating. As parents, it is tempting to get out theLeap Pad, the tablets, the I-pods, and let the kids have at it with the guise that it is supposed to be educational. However, I think that it causes overload, and sadly, I think it has been affecting my kids’ ability to play and create. 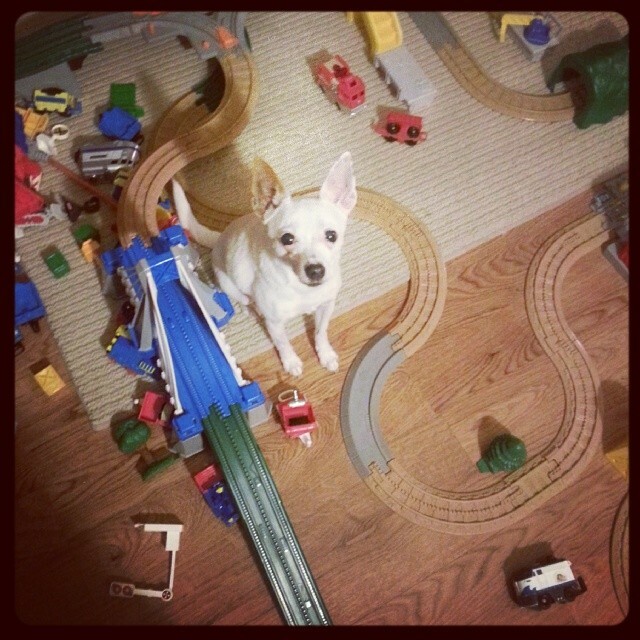 The best part of building is when Pupzilla comes to destroy the city! I think as parents, we worry about our children’s minds being stimulated. We want the best for our children. We want them to get ahead and be the best they can be. However, I think sometimes, it is equally as important to make sure our children are engaging in playtime with simple toys that inspire creative play. Childhood is such a short period of time, and I want the kids to remember the time that they built the world’s biggest blanket fort, not the time they got a new high score in Plants vs. Zombies. How do you limit your child’s electronic time? Have you ever dealt with electronic overload? Please feel free to share in the comments below and be sure to check me out on Facebook too!